We have all been there, having a healthy or not so healthy relationship with food for days, weeks, or months at a time. And yes I say relationship because there are good days and bad days, sometimes food gives you tons of energy, sometimes it brings you down, and you might even cheat every so often. Ever since I was in high school I have really struggled with finding a healthy balance with my diet. I spent years of not eating enough or binge eating when stressed or emotional. I am still working on maintaining a consistant healthy balance but I have learned a lot about myself and how food makes me feel along the way. I choose to eat healthy because I enjoy how my body feels when I nourish it with natural foods. But that’s just me, I truly have come to enjoy eating a healthy diet with a few treats or cheat meals here and there. Now that doesn’t mean that I’m perfect. I definitely have regrets after some meals from overeating or eating foods that don’t make me feel good. But I have learned I can’t let one bad meal, day, or week of eating bring me down. Rather I use it to motivate myself to get back on a healthy track. I have tried so many diets and plans, but nothing ever seems to work long term. When I came across one particular list of diets for weight loss I realised I was doing everything wrong. I needed to learn about the foods I was eating, what my body really needs, and to slowly change the way I think about food. I truly believe food and meals should be something we should enjoy. I could never tell someone to eat KALE everyday if they hated it. So listed below are the top ten lifestyle changes I have made and continue to work on to have a healthy relationship with food. I hope even the healthiest of readers can find some of this information useful or can relate. 1.) Carbs are NOT bad for you and you should NOT eliminate them from your diet! I believe everyone (myself included) thought at one point or another carbs were making them gain weight. First of all carbs give your body energy, if you deprive yourself of carbs then your body needs to use protein as an energy source, and therefore the protein you eat cannot be used to build muscle. Second it’s all about the carbs you choose to eat. A diet rich with fruits, vegetables, and complex whole grains will help give your body the energy it needs and aid your digestive system. That bring me to number two. 2.) Find foods that make your digestive system happy. In other words foods that give you healthy poops, hehe. Experiment with giving up on certain products or foods that may make you irregular or bloated and talk to your doctor or specialist because they may be able to help you identify any food intolerances you may have. And if you are constantly feeling bloating start with trying to limit your intake of salt. 3.) Treat yourself. I can’t tell you the number of times I have told myself I am NEVER eating _______________ ever again. And sure enough a few weeks/months later I’m indulging in whatever food I thought was so ‘forbidden’. So I suggest every week pick a meal or two that you are going to indulge in. I usually eat pretty healthy throughout the week so on the weekend I have no regrets if I order a pizza and drink a few adult beverages. Or sometimes during the week I am craving a good dessert, so ice cream or chocolate it is. Do not make these treats every day, earn them, and enjoy the moments you can eat them. 4.) How you stock your pantry is key. I have an addiction to snack food, particularly pretzels and tortilla chips. But if I don’t buy these items I don’t really think about them. Try to clear your pantry of any unhealthy choices you think about daily and buy these items only occasionally and in smaller sizes. 5.) Surround yourself with people who support your healthy views on food. It has been said that family and friends can be the biggest influencers on your diet. Don’t be embarrassed to talk to them about the foods you prefer to eat to maintain a healthy lifestyle and even ask if they will join you for support. I spent years dreading dinners with friends because I didn’t want them to judge me if I just ordered a salad. True friends will always support any lifestyle changes you decide to make. 6.) Read labels. I am so interested in food and nutrition that I honestly love reading food labels. And if I don’t know an ingredient, I’ll research it. 9 times out of 10 if you can’t pronounce an ingredient in an item it’s probably not natural and not good for your body. Get to know simple terms such as partially hydrogenated, high fructose corn syrup, and colored dyes, all ingredients that have been proven to cause health problems. Here is a great list of Toxic Food Ingredients to stay away from. Also read labels for serving sizes, especially in packaged food. A serving is probably a lot smaller than you imagine. 7.) Eat a colorful diet with lean protein. This works for me. I feel my best when I eat a variety of fruits and veggies with lean protein such as chicken, turkey, or lean ground beef and complex carbs. That doesn’t mean I never eat chicken wings or chocolate, but only occasionally and in moderation. Being a vegan, vegetarian, or eating a paleo diet may work for you. Find what works best and try to stick with it as much as possible. Your body definitely prefers routine. 8.) Plan, plan, plan. Or Meal prep. Spend a few hours a week getting as much fresh food as you can prepped and ready for the week. I usually try to prep a bit on the weekends so dinners come together quickly during the busy work week. But if I don’t have time for a lot of meal prepping I make sure I at least have some healthy snacks like veggies, hard boiled eggs, and energy bites prepared. I also keep granola bars and almonds in my desk in case I am desperate for a snack. 9.) Eat breakfast. I spent years never eating breakfast and man was I missing out! Now I have a green protein smoothie and coffee and then some oatmeal when I get to work. Eating breakfast gets your metabolism going and provides you with energy throughout the day. Skipping breakfast has been linked to weight gain, malnourishment, and other health issues. So give yourself a few extra minutes in the morning to make sure you have something to eat. 10.) Establish a routine. Some people like to eat three larger meals a day. Others like myself like to eat three smaller meals throughout the day with snacks, so in essence I eat every 3-4 hours. Find what works best for you and your schedule and make it consistent. What healthy lifestyle changes have you made recently? 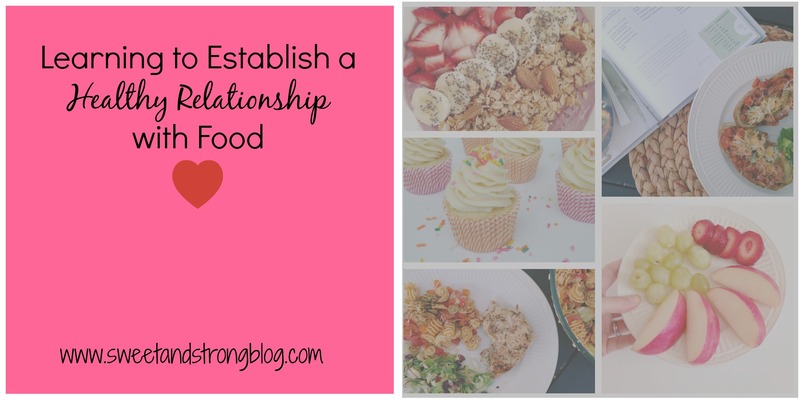 Have you ever felt like you were struggling with your relationship with food? Tell me about it in the comments below. Your email will not be published.